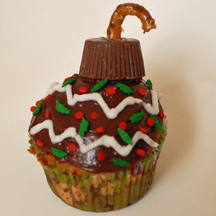 You can use a Rolo, peanut butter cup or similar candy to complete this Christmas cupcake, and then have fun decorating the rest of it any way you’d like. What You Need: 1 cupcake (baked and cooled); chocolate frosting; Rolo or mini peanut butter cup; curved section of pretzel; writing icing; sprinkles. How to Make It: Frost cupcake. Use something pointy to “drill” hole in top of candy wide enough to stick in pretzel without it breaking. Place near edge of cupcake top. Finish creatively with writing icing (or bag and tips), sprinkles and so on. You can make a whole batch of designs! This entry was posted on Wednesday, December 5th, 2007 at 4:00 am	and is filed under Christmas cupcakes. You can follow any responses to this entry through the RSS 2.0 feed. Responses are currently closed, but you can trackback from your own site.